Submitted by witness on Tuesday, February 26, 2013. TIME AND CONDITIONS: IT WAS A NICE DAY IT WAS EARLY MORNING BUT GOOD LIGHT. I interviewed the witness on two occasions, Feb 25, 2013 and again on March 4, 2013. This is an amazing, rare sighting and I wanted to double check every detail. Early on a January morning in 2008 at approximately 7:30 am the witness was driving to the undeveloped property he inherited from his late father. As he came around a curve he saw a black furred animal sitting in the middle of the gravel road with its back towards the witness. The witness rolled to a stop approximately 10 feet away from the animal. 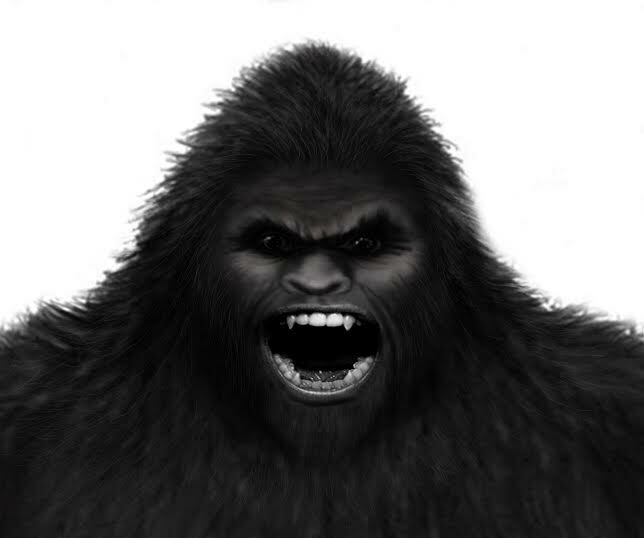 He honked his horn then immediately saw a female approximately 7 ½ feet tall, covered in brown hair, swiftly walking bipedal out of the brushy, thick woods on his right to the small animal in the middle of the road. She scooped up the juvenile with her left hand and placed it on her back, and the juvenile then grabbed her around her short neck. The female glanced at the witness briefly as she exited into the woods downhill to his left. The witness stepped out of his car and stood in disbelief thinking he had just been hoaxed, but then a rock hit the roof of his Mercury Sable. The witness turned around and saw a male approximately 6 feet from the back of his car. 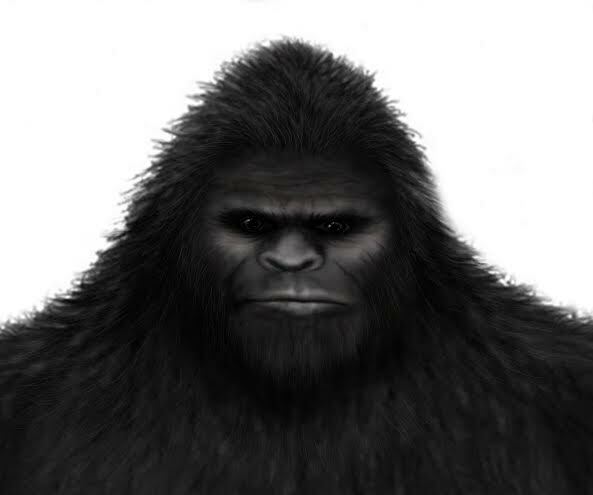 The Male was approximately 9 feet tall with extremely large shoulders and broad chest. He was covered in black hair tinged with gray except for his flat nose and up to his wrinkled forehead, and he looked at the witness with intense black eyes. The male then roared at the witness with a showing of its upper teeth. The witness jumped back into his car and watched in his rear view mirror as the male ran into the woods in the same direction as the female and juvenile. The witness then drove approximately 150 yards to the entrance of his property. He got out of his car and stood there in awe looking back down the hill. He could hear rustling in the woods and snapping of branches. He had small rocks thrown in his direction. He waited until the noises subsided and then got back into his car and drove back the way he had come. When he got back to the location of the sighting he noticed a dead deer on the side on the road to his left. It was a doe nearly torn in half and gutted. If these events are true then this is an extraordinary sighting of a family unit. The witness was extremely reluctant about coming forward with this story, fearing his reputation, but I encouraged him to share his story and submit a report. I also hope to meet this witness personally and have him show me the exact location in the near future. This area has varied terrains and plenty of fresh water sources, as well as game for food. Attended and organized numerous BFRO Expeditions starting in 2007. In the states of Arkansas, Colorado, Kentucky, Missouri, Oklahoma, Tennessee and Texas. Ron is an avid student of the outdoors, ecology, folklore and regional history.